Okay, this is not hip hop/soul a la BBD/Poison/Rickey Bell hittin’ us up with his high notes… because K. Gaines and Johnny Voltik reach far beyond our aesthetic taste buds on this track and reprograms our soul. If you like lyricism with a touch of old soul then this track is for you. Johnny Voltik’s vocals are already on repeat in my head! 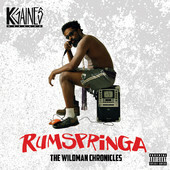 “Calvary” is the third single from K. Gaines’s project “Rumspringa: The Wildman Chronicles” which is now available on iTunes. Enjoy?